Hire Deoch 'n' Dorus - Traditional & Unique Ceilidh Band! 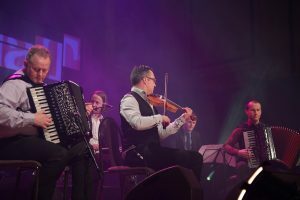 Deoch 'n' Dorus award winning ceilidh band will provide a traditional, yet original Scottish ceilidh sound to make sure that you have a great night of dancing! Deoch 'n' Dorus are one of Scotland's top ceilidh bands. Voted Best Scottish Dance Band 2012 at the MG Alba Traditional Music awards in Fort William. You are guaranteed a professional level of musicianship, as they have played worldwide and performed with some of the best traditional musicians on the folk scene. Deoch ‘n’ Dorus were formed in 2001 and are all professionally trained R.S.A.M.D. musicians. All Graduates of the RSAMD tradional music course. Two albums on the Skipinnish Label 'Deoch 'n' Dorus' & 'The Curer' Four "Take the Floor" BBC Radio Scotland broadcasts and years of experience gigging all over the globe. Their musical styles and interests had gelled instantly and they have gone on to become favorites on the ceilidh and festival scenes. Their music contains great energy and exciting arrangements that serve well with both dancing and listening audiences. With a line up of accordion, fiddle and drums, and dances being called if required, the dynamic youthful trio will play lively music for your special occasions, weddings, birthday parties, anniversaries, etc. and they will ensure you have a memorable evening!